Adapted books might be one of my favorite parts of teaching special education. They give my students motivation and purpose for reading, plus it checks for student comprehension in a fun and easy way. Some of my adapted books in my classroom I have written myself, such as my environmental print Fast Food book or the Shark Hygiene book based on skills I felt my students needed to work on. Other books I have taken apart (usually you can just carefully tear it apart), added symbols from Writing with Symbols or Board Maker, then laminated, and added adapted pieces with Velcro. Here's a few of my adapted books. Hope they give you some ideas of all the possibilities! Who Lives in the Arctic? : I love these simple scholastic readers! I added symbols on top of the words that were already written in the book. I found other pictures that describe the picture through clip art. This makes for a higher level comprehension, the student looks at the picture, the symbol, and has to then find the clip art of that same animal to add to the picture, so essentially have to recognize that three different pictures of the same animal represent the same thing. I used our book binding machine at school to put this together, but if you don't have a book binding machine, you can hole punch and add book rings. The Way I Feel: I added one sentence that summarizes the content on the page (I feel ____ when _____) in addition to the words already on each page. This is a great book for staff and students to read together. The staff reads all of the "regular" words, and the student can read the symbol sentence strip. The student then also chooses the correct feeling picture to add to each page. Frog's Lunch: I did not laminate or add interactive pieces to this book; however I added symbol support to the words on each page. My purpose in adding the symbols to this story was to give support to my emerging readers. How I placed the words on the page depending on the format in the book. I like to keep the book text readable when possible, but for paragraphs I covered the entire thing (see the examples below). 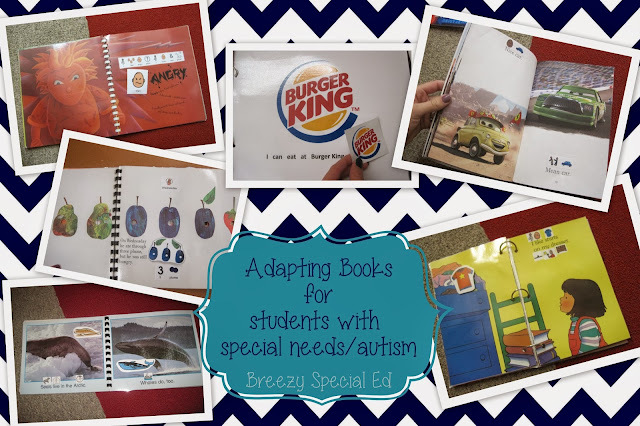 See a few other adapted books that I have created for my students on my blog and grab free downloads too! Also, don't say I didn't warn you - creating adapted books can be VERY addictive and your students will love you for it!